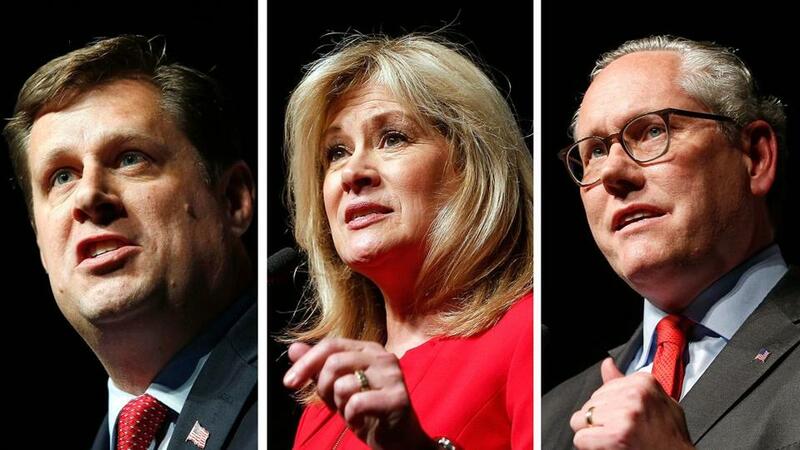 State Representative Geoff Diehl, longtime political operative Beth Lindstrom, and Winchester businessman John Kingston compete in the most high-profile statewide Republican primary in years. Hungry to flex their President Trump-fueled enthusiasm, conservative GOP activists in the state are funneling their newfound energy into this year’s three-way primary, which will yield the party’s challenger to Senator Elizabeth Warren, the fiery liberal incumbent they love to hate. The fight among state Representative Geoff Diehl, longtime political operative Beth Lindstrom, and Winchester businessman John Kingston is the most high-profile statewide Republican primary in years and, in this election cycle, the most active. That’s providing the state party’s right flank, which found a rallying point in Trump, with an opportunity to channel years of feeling ignored by the state party’s embrace of more moderate Republicans, including Governor Charlie Baker. Diehl, whom some Republicans see as the front-runner, has openly embraced his connections to the president. Lindstrom has been more careful to keep Trump at arm’s length, but like Trump she has seized on immigration as a core issue, trumpeting her opposition to so-called sanctuary cities in an appeal to the right. Kingston, once a staunch Trump critic, has sought to convince activists he now supports him. “Unquestionably, the energy in the Republican Party, even in Massachusetts, rests in the Trump wing,” said Rob Gray, a Boston-based Republican strategist. “I don’t know if the party as a whole is leaning that way, but the energy factor is an indicator of who’s going to show up and vote on primary day. And I believe the Trump voters will show up. Diehl, a four-term Whitman lawmaker, co-chaired Trump’s 2016 state campaign and has squarely aligned himself with the president in a state where many Republicans voters — 68 percent of those polled in one survey — view him favorably, but the majority of voters do not. Diehl has also built a lead in early polling, holding at least a 10-point advantage over Lindstrom and Kingston in a late June survey conducted by WBUR/MassINC; nearly 50 percent of those polled did not commit to a candidate. He has supported Trump priorities such as building a border wall, and he has sought to parlay his relationship with the president into a positive to voters. Lindstrom and Kingston have been more careful in discussing the president. Kingston, meanwhile, was once highly critical of Trump, even putting $1 million behind an effort to find a third-party presidential candidate who could deprive Trump of electoral votes in 2016. Kingston’s campaign did not respond to requests for an interview. Then, of course, there’s Senator Warren, one of Trump’s most ardent political adversaries and perhaps the biggest draw for conservatives to turn out on Election Day. “You’ve got the whole Trump effect, and you’ve got the person [in Warren] who brings out the most visceral reaction in activists. It’s a perfect storm,” said Gabriel E. Gomez, who was the Republican party’s nominee in the 2013 special Senate race. He topped Michael Sullivan, an anti-abortion, pro-gun conservative, by 15 points in the primary but later lost to now-Senator Edward J. Markey. Gomez, who said he’s since unenrolled from the Republican Party over his opposition to Trump, considered launching an independent bid against Warren, but ultimately decided against it. Kirsten Hughes, the state party chair, said the party is confident a competitive primary will engage voters and “ensure that the GOP nominee is well-equipped to present a stark contrast” to Warren. “Republicans are energized about the prospect of challenging and defeating Senator Elizabeth Warren and her extreme, hyper-partisan record,” she said. How many will actually show up on Sept. 4 to pick their preferred Republican remains a question. The 2013 special Senate primary drew 190,000 voters. About 15 months later, 160,000 voted in the sleepy 2014 gubernatorial primary between Baker and Mark Fisher. Less than 11 percent of registered voters in the state are Republicans, though those who are unenrolled — the biggest bloc among Massachusetts voters — can vote in either primary. Gray, the Republican strategist, said he expects this Republican primary to draw a similar amount as 2013, which could maximize the sway a “core of energized Trump voters” can have. But Mary Lou Daxland, president of the conservative Massachusetts Republican Assembly, said she sees a marked difference in energy compared to five years ago. And the reason is very Trumpian. “I think the party’s angrier,” she said.